Hiri will tame the most unruly inboxes, stopping you wasting time on bad habits and helping you write better emails that get results. If managing your emails has become a chore, Hiri could be a game-changer. This premium email client is packed with thoughtfully designed tools to help you spend less time managing your inboxes and write more effective messages – and it really works. Hiri is currently available for Microsoft email services (like Outlook, Hotmail and Exchange). It’s designed primarily for business users – hence the focus on Microsoft – but it’s also a great tool for anyone whose personal inboxes are running out of control, and will become even more so when it evolves to include other email providers. Best of all, Hiri is free for TechRadar readers. Just visit https://www.hiri.com/techradar/ and enter your email address. Hiri is a pleasure to use thanks to a slick, professional interface that puts all the essentials at your fingertips and encourages you to adopt better habits. Emails very rarely need to be dealt with immediately, but it’s easy to fall into the habit of checking your inbox every few minutes. Hiri aims to solve this problem with a dashboard view that tells you how many new messages you’ve received, but also how long you should wait before plunging into them. When it’s time to dive in, you’re given a choice of two inbox views. Unified inbox shows all messages regardless of their status, whereas zero inbox lets you drag emails into different folders (ideal if an empty inbox gives you a warm fuzzy feeling). The Compose window doesn’t overwhelm you with options for embedding media and applying elaborate formatting, instead offering just the essentials: bold, italic, underline and strikethrough, numbered and bulleted lists, and hyperlinks. This forces you to focus on the content of your messages, and keeps them straightforward and easy to read. Hiri also puts the subject line at the bottom of the ‘Compose’ window, on the grounds that you’ll write a better, more concise one once you’ve done the body of the email. Hiri uses ‘Action’ and ‘FYI’ fields instead of the usual ‘To’ and ‘CC’ . They essentially serve the same purpose, but if the recipient also uses Hiri, the email will land in a dedicated inbox so they can see immediately if a message needs active attention. You can also add tasks to emails, which is far more convenient than using a separate task-management tool like Trello. There’a also an excellent calendar, including a scheduling assistant to avoid clashes. At the end of the week, Hiri will present you with a report on your writing style, including clarity, brevity and tone. It might sound a bit dry, but it’s actually very simple and almost gamifies emails..
A good looking client that connects your social apps to your emails. 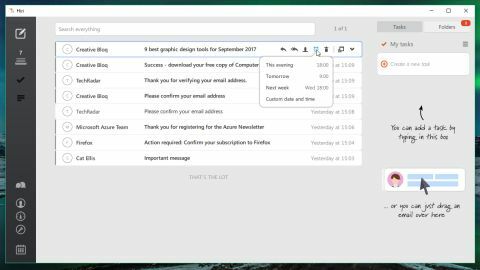 A simple looking, but powerful email client for advanced users. An open source client that supports unlimited email accounts.